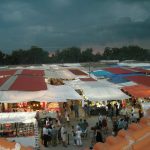 One of the most famous and important fairs, not only in the Halkidiki region, but the wider area, is that of Agios Mamas, which for four days every year – in the beginning of September- attracts thousands of people. Old fashion trade fair while at the same time various cultural events take place, such as the Symposium of Ag. Mamas (food with grilled sausages). 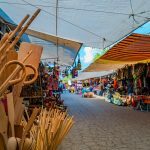 This festival lasts for one week and includes a trade fair, concerts of traditional music and other events. The fair’s roots are lost through the centuries. The tradition refers that it began as a memorial service for the unburied dead people who fell in a battle. Two battles like this one are referred in the area, one during the Greek War of Independence of 1821 an one during the Peloponnese War. The first mention for the fair is in 1870 and in 1932 it was legislated by law. 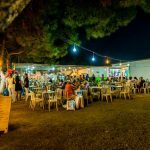 The traditional fair of Agios Mamas has also been an inspiration for the awarded documentary “Ay Mama Panair” ( trnsl. Agios Mamas fair) directed and produced by Eleni Stoumbou (Scientific Supervision: Ioakim A. Papangelos).